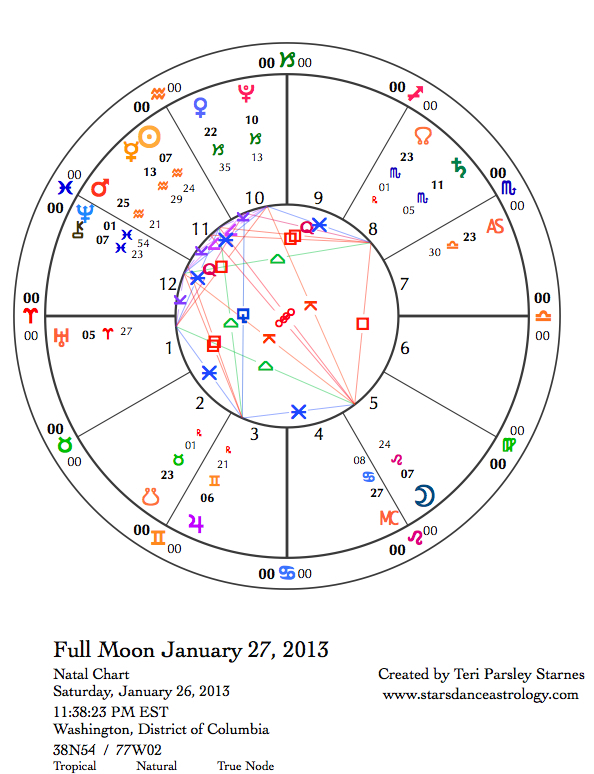 Follow the Moon: Forecast January 13, 2013 – January 19. This lunar cycle, begun in the sign of Capricorn,* helps us to get in touch with our desires for mastery. The goat part of Capricorn’s mythical animal, the Seagoat, climbs a personal mountain towards excellence and authority. (We will look at the fish part of this animal later.) Yet, this journey toward excellence is not simple. A lot of conflicting emotions can come up. Shame is one of them. Is shame actually fear of mastery? The root of the word “shame” comes from the Proto-Indo-European languages meaning “to cover.” You know the heat of embarrassment that enflames your cheeks and makes you want to hide your head? Yes, that kind of cover; that is shame. Shame only comes up around something we care about deeply. So, why cover it? Why hide from our own authority by covering up our gifts and aspirations? I’ve noticed in myself an impulse to hide my deepest longings until I can get over the shame I feel for aiming high. The shaming questions: How dare I? Who do I think I am? Brash, bold, outright longing belongs to the realm of mastery. Without it, we sell ourselves short, bury our potential, and cut ourselves off from energizing forces of life that help us achieve mastery. My guess is that it doesn’t have to be this hard. As the Moon waxes this week, let’s use that light to brazenly reveal our desires for mastery. The first steps may be to admit to our selves that such longing exists. Brene´ Brown is my favorite writer/speaker on the subject of shame. Check out her wonderfully inspiring Ted Talks at http://www.brenebrown.com/videos/. She speaks about the research she’s done of the folks who live lives that aren’t saddled by crippling shame. She has found that these people share a quality: wholehearted vulnerability. By this she means risking being seen for what we most desire, who we really are. Venus is the star of this week’s transits. Venus rules our connectivity—how we relate, what attracts us, and is attractive in us. Here is an interesting bit of information from Brown’s Ted Talk. She defines shame as the fear of disconnection from others. We fear that if others see the shameful thing inside us—like that brazen desire for mastery—we will not be worthy of connecting with others. We’ll be rejected. Venus reflects the part of us that wants to please. This quality can either aid or hinder us as we encounter the shame demons inside. The desire to be connected can help us achieve that vulnerable wholeheartedness that Brown talks about. Yet, the fear of rejection can deflect us from our worthy goals of mastery. Through the Venus transits this week, I invite you to invoke the aspects of this goddess that inspire you to risk exposure and claim your heart’s desire. Forecast January 13, 2013 – January 19. Sunday, January 13. The Moon joins Mars in Aquarius at 2:37 am** as its last aspect of the entire day. This means the Moon is void-or-course (VOC) all day. I don’t consider VOC Moons to be problematic. In fact, I like the opportunity to pay attention to the difference in energy on such days in comparison to the days that the Moon makes several contacts. A lot of distracting noise gets cancelled out and we get to focus on just this one thing: The Moon is in the Fixed Air sign, Aquarius, and it reverberates with Mars passion all day. Considering that we are also in the waxing new phase of the Moon, we will want to take action, begin new things, especially in the realms of ideas and communities. The caution with a VOC Moon: Be extra mindful of what you attempt to initiate today. It pays to let awareness guide action rather than the other way around. January 14—Crescent Moon: Beginning. Now, both the urge and the support for beginning new things are aligned. Go for it. Because the Moon is in Pisces, our feelings play a big role in what we decide to begin this lunar cycle. The Venus aspects today give us the opportunity to shift shame into wholehearted vulnerability. How will you expose yourself today in the realm of mastery? What do you want to be known for? What do you want to be loved for? Venus in Capricorn contacts Chiron in Pisces with a sextile aspect, then forms a quincunx aspect to Jupiter in Gemini. Chiron and Jupiter are approaching a square aspect to each other, exact tomorrow. The possibility to be stressed by feelings of exposure and vulnerability are high, yet there is clear benefit too. How wonderful it feels to risk showing our true desires and to meet acceptance and support from others. What a gift it is to be seen and accepted. If you don’t find this support in your life today, it is time to search for the people who will love you for who you are. We also get to be those supportive people for others who are coming out of hiding. Welcome true vulnerability in your self and others today. Tuesday, January 15. Although the Moon is not void-of-course today, it only makes one aspect: a sextile to Mercury in Capricorn. Mercury is our ally of commitment to mastery today. What truth needs speaking? With support from the Moon, this realization may come from dreams, intuition, or ideals. Wednesday, January 16. We step from the dreamy realms of Pisces into action and reaction today. We may feel tested. Venus conjoins Pluto this evening but we’ll feel the passion earlier as the Moon enters Aries. Will we be liked if we show our true selves? Not always. Today the test is to find the reason to be true to ourselves even when we aren’t liked. Yet, the impulse to “go it alone” can be taken too far. So, the trick is to know when to do that and when to stay in relationship. Connection with others helps us to moderate the behaviors that can get in the way of our mastery. There is no such thing as perfection, only opportunity to learn. Thursday, January 17. Let’s just say, all that was true yesterday is true today too. Another aspect with Venus gets thrown into the mix, however. Today Venus contacts Saturn in Scorpio by a sextile aspect. We are supported to move through our challenges. True friends and partners will support us in what we need to do to acquire authentic authority in our lives, even if it means telling us an uncomfortable truth. We feel strong enough to handle it. January 18—First Quarter Moon: Manifesting. 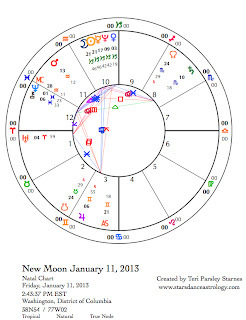 This phase of the Moon is a good time to take definitive action on behalf of our New Moon intention. That doesn’t mean we won’t feel challenged. That is sort of part of the deal. This morning Mercury joins the Sun in its superior conjunction phase. Both planets are near the end of Capricorn. 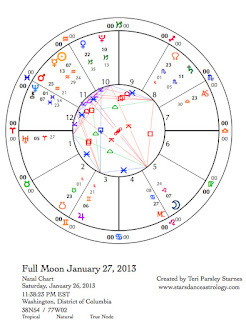 Some astrologers see the superior conjunction as the Full Moon phase of the Mercury/Sun cycle. When the illuminating rays of the Sun contact the creative mind of Mercury, what is realized? Confidence and commitment feed our dreams of mastery. Each of us deserves to live a life free of shame. Imagine that life into reality. This evening the Moon moves into Taurus and we become mindful of sustainability. How do we sustain forward momentum? What relationship do we need to have to money, our bodies, and our values in order to manifest our intentions? And it is also a fun time to indulge in the pleasures of life. Notice what feels the most satisfying to you. Saturday, January 19. The darkest part of Winter is over. The Sun and Mercury enter Aquarius today and the focus of our lives turns toward the future and waking up as if from a long dream. Do you want to hit the snooze button or jump out of bed? There is a lot to do; yet the Moon in the Fixed Earth sign today may have us asking the question, What’s the hurry? Notice if you feel the tension or frustration between these two states of being. The Moon opposes Saturn and trines Venus. How important are your connections with others in helping you on your path of mastery? If you have been holding the intention of banishing shame on the path of mastery this lunar cycle, what have you noticed? I am aware of painful memories from this cycle: the killings at an elementary school, a death of a dear friend of mine, a hunger strike by a First Nations chief in Canada, the report of tens of thousands killed in Syria in their civil war, and more. Yet, even in the middle of this cycle, there was beauty and wonder too. What does it mean, this pain and beauty? If I fail to remember it all, even the pain, I might never get to grasp the meaning. I might lose my grip on my role in this great act of co-creation. Each of us plays a part. Each of us needs to find a way to hold on to that vision. Perhaps the final effort we make in support of this lunar cycle’s intention** “ to embrace the Magician within as a co-creator of the manifesting cosmos” is to remember the important things—both the painful and the joyous. This week, transits involving Mercury, Jupiter, Saturn, and Pluto recall the themes of this lunar cycle. Mercury and Jupiter in Mercury’s sign, Gemini, have served up the archetype of the Magician—the one who stands midst paradox and pauses between stimulus and response to choose consciously. Saturn and Pluto are constant reminders of the fertile depths in our souls. We are stretched between these two states: the wonder of magical possibility and the responsibility we hold for the actual world we live in. Last week I wrote: “’Wallowing in doomsday scenarios is not the solution,’ says the Magician.” This week, I believe the Magician is saying: “Denying the realities we see around us is a forgetting of true purpose.” Wherever we feel such paradox, the Magician is dancing through the worlds. Forecast January 6, 2013 – January 12. Sunday, January 6. Mercury in Capricorn and the Moon in Scorpio reinforce the sextile aspect that has been ongoing between Saturn and Pluto. Last week, I wrote about this aspect seeming like a plow turning over whatever has lain dormant and hidden within. We are plowing the fields of soul to prepare the soil for new life. With the Moon and Mercury’s help, we feel this strongly today and are able to give it voice. This is a great day for journaling, remembering, and honoring our visions. Monday, January 7. Today, I invite you to develop the faith that even when nothing much seems to be happening on the outside, a great deal is going on underneath. Mars in Aquarius is concerned about seeing vision put into action. What new world are you working toward manifesting? Don’t get frustrated today if it feels like you aren’t making progress. Saturn in Scorpio challenges our assumptions about progress. The Moon in Scorpio goes void-of-course early in the day and stays that way until tomorrow. Better to practice quieting the mind. Pluto, the ruler of Scorpio, enters new territory (reaches a new degree in the zodiac since turning retrograde last fall), making the transformation of culture a priority. With all things Pluto, however, change comes from the depths. Honest self-assessment helps us see those depths. January 8—Balsamic Moon: Surrendering. The challenge in this phase of the lunar cycle is to surrender our defenses around remembering the pains and joys of the past few weeks. The Moon in Sagittarius lights up a fiery arrow pointing towards understanding. We want to understand what has happened to us. Everyone wants a sense of control over chaotic experiences. Yet having control may be a failure to truly feel our whole selves. Honor how much of your heart is available to you right now and honor the ways that you simply can’t feel any more. It is OK to be where we are. The Moon is opposite Jupiter today. Signs and portents are everywhere if we look—in the small everyday occurrences as well as in the big moments of understanding and insight. Tonight, Venus enters Capricorn. We find beauty in accountability and determination. Wednesday, January 9. The Moon makes no aspects today, and so is void-of-course until tomorrow when in enters Capricorn. Since the Moon also is in the last days of this cycle, it may be best to use this day to complete things, to find time for reflection, or to do your exploring through a good book. Even though we may be drawn to quieter activities, this is not a gloomy day. A lovely sextile aspect between Venus and Neptune inspires us to find the beauty that connects us. Thursday, January 10. Many planetary allies are encouraging us to be in the real world today. The Moon first contacts Neptune, the ally of dreaming into reality; then Venus, the ally of beautiful integrity; next Uranus, the ally of authentic commitment; then Pluto, the ally of cultural transformation; and lastly Saturn, the ally of far-reaching accountability. Take in what serves you and let go of the rest. What message will the Magician leave you with today? 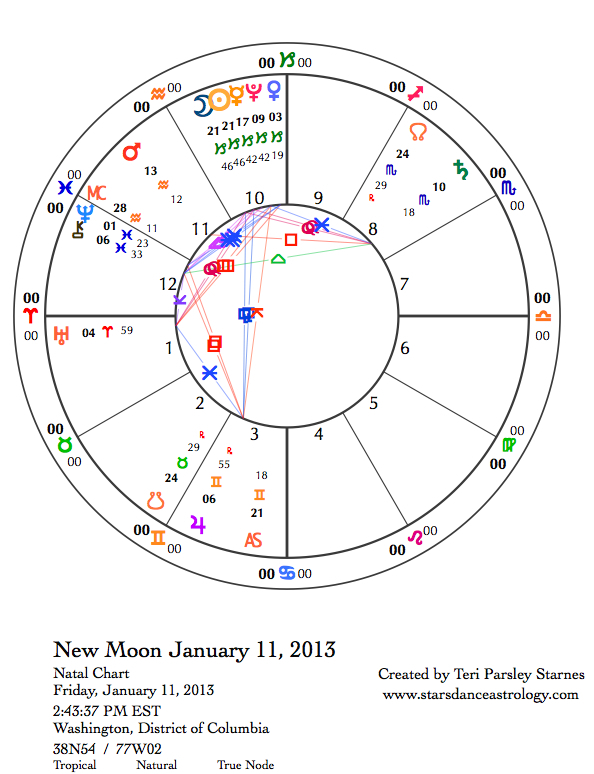 January 11—New Moon: Dreaming. Capricorn has a tough reputation. People can feel intimidated by this sign. I admit I’ve felt the same. The self-judger in me fears I do not have the gravitas to match Capricorn’s natural authority. It is easy to let Capricorn’s innate integrity and brilliance create comparison that causes feelings of shame and guilt. This is just too bad since Capricorn has so much real goodness to share with us. The sign of the winter season is focused on collective survival at the highest level. How do we come through the lean times of winter as a group? What ancestral wisdom will help us? How do we encourage the best of ourselves through high expectations? Can we make the hard choices by holding each other accountable? Capricorn sets worthy goals, and does it in such a devilish way that we are challenged but also immensely entertained. I am convinced that Capricorns have the best sense of humor. The lunar cycle that begins today is grounded in Capricorn presenting a good opportunity to work with Capricorn’s gifts and to transform self-judgment, shame, and guilt into realizing those gifts. What if shame were banished? How would that shift our relationship to excellence and achievement? Saturn, the planetary ruler of Capricorn, is square to Mars in Aquarius. Pay attention to frustration. Do you judge yourself when things don’t move forward easily? Saturn is the great teacher. The lesson could be to slow down, to go for quality over speed. Another lesson could be to negotiate between the need for transparency and the need for secrets. Mars may tease out some secrets; Saturn may insist that not everything needs to be aired in the open. Uranus in Aries is square Venus and Pluto. Long simmering tensions may erupt this month in relationships. Idealized relationships are not realistic. Notice judgment and assumptions around perfection in relationship. It is possible that even conflict can improve them if we commit to integrity and fairness. A stationary Jupiter in Gemini is square to Chiron in Pisces. It can be really hard to integrate our hearts and minds. Often we split from one to retreat into the other. Where do you escape when faced with suffering? Problems may seem large. Vulnerability is nothing to be ashamed of. Regardless of these challenges or others in your life, how does shame get in the way? A dear friend once enlightened me to the true nature of shame. The beginning letters of the word stand for: Should Have Already Mastered Everything. When put that way, we see the absurdity of shame. Time to do some work here. Saturday, January 12. Visionary energy is strong. How do we create a better world? Part of that better world is finding authenticity in relationships. As Venus squares Uranus, we may feel frustrated that we can’t be our true selves in relationship. Come out from hiding and see how to make those relationships reflect the world you envision.